2 down and 2 more to go! It’s been three years in a row that we have “celebrated” Yom Kippur at the Hyatt hotel. As an observant Jew we walk to synagogue multiple times a day, fast (yes that includes no liquids or food of any kind) and no use of electricity for 25 hours. Doing this becomes quite difficult with a toddler, therefore we gather with 100+ observant Jews to “celebrate” together. I grew up going to hotels with my parents and siblings to observe the fast with our synagogue. It was easier and more convenient for my family then and it seems to be the same now with my own family. However, this year was different. The first year I was pregnant and leisurely walked around the hotel. Last year Sarah was an infant and was able to be pushed around in a stroller. As a toddler this year, she did a lot of running through out the hotel. Luckily they had hired babysitters to watch the kids in a separate room filled with lots of toys. Theoretically, this meant that I could leave her to play while I went downstairs to pray. This was an ideal situation, however Sarah was sick (again)! Which meant for a very needy baby who didn’t get enough sleep. After 2 hours of trying to put her to sleep we let Sarah cry it out. It took 10 agonizing minutes but she slept through the night and woke up around 7 am refreshed. It was a hard parent moment but I knew if she didn’t get sleep, I wouldn’t get sleep and therefore be a miserable faster. We spent the day walking around the hotel, going up and down the stairs, playing in the kids room and hanging out with my mommy friends Ellah and Chana (they have kids around Sarah’s age). Later in the day my mother-in -law came to help and hang out. She took Sarah in the play room while I relaxed and read some magazines. Sarah napped for only 45 minutes as did I. Hubby took her for a walk and I prepared for evening services. We counted down the hours and waited to hear the Shofar blown. As I finished reading Neilah I made sure to connect with g-d and share a few words with him. After a quick sip of delicious water we headed back to our room to pack up. We got home quickly. Bathed and put Sarah to sleep. Ate the food we prepared before the fast and went to bed. Fasting takes a lot out of you and having to run after a toddler didn’t make things easier. All in all it was a successful Yom Kippur. My dad use to tell me and my sisters that if it was easy for us to fast then we were a good kid that year and if it was a hard fast we were not well behaved. I don’t believe it as an adult but a lot of planning and being with friends that are going through what you are going through really helps make the day go by faster. Next year in Jerusalem (or the Hyatt)! 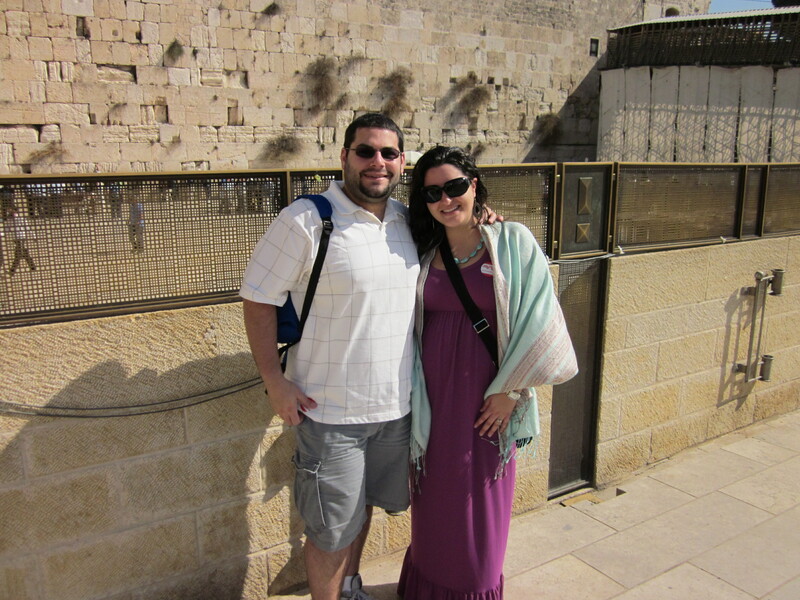 Hubby and I at the Western Wall in Jerusalem pregnant with Baby K!